Looking for the next great book? Parent: "I need a good book for my son." Me: "What books has he already enjoyed?" Me: "Great! I know exactly what to recommend." First of all, if your kid loved the Diary of a Wimpy Kid books, take him to see the movie. It's heartwarming and every bit as good as the books. 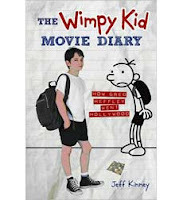 If he's seen the movie, then make sure to get The Wimpy Kid Movie Diary. It's the "making of" the Wimpy Kid movie and he will love the book. For more information about it, check out my post - it'll tell you all about it. As you know, the Percy Jackson series was about a modern-day boy dealing with monsters and gods from Greek mythology. Your kid (and you) will be thrilled to know that the author, Rick Riorden, has started a new series - this time drawing on Egyptian mythology. The Red Pyramid is the first book in the new series The Kane Chronicles. It's about a brother and a sister who have family bloodlines that go back to ancient Egypt. That makes them, it turns out, very powerful magicians and it gives them mystical abilities which they discover throughout the course of the book. 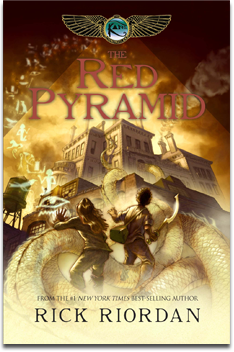 The Red Pyramid has the same rollercoaster excitement of the Percy Jackson series, it's action packed and it's one of those books you just can't put down. I found it much more fact-heavy than Percy Jackson - which I found impeded my enjoyment of it a bit, but which actually makes it more attractive to boys. Boys love facts. They love to collect information about things that are interesting to them, and The Red Pyramid gives them tons of useful information about Egyptian gods, goddesses and monsters. My son is in the middle of The Red Pyramid right now and he's eating it up like candy. His reaction seems to be typical amongst boys. The other day he was on a playdate and suggested to his friend, "Uh, let's take a break and, um, maybe read a bit?" Basically, he was thinking about his book and wanted to get back to it - in spite of the fact that he was in the middle of a fun playdate. His friend said, "Whaa-?" And my son tried to recover: "No, that's silly - we can read later. We'll just play a video game or something." A-heh. I love that little exchange because it illustrates the kind of pull a really great book can have on you. It becomes like a little obsession that you think about and want to get back to as soon as possible. Here's the official website for The Red Pyramid/The Kane Chronicles. It gives you a great overview of the book. Links to related information are "coming soon." The site says that book 2 in this series will be coming out in Spring 2011 and book 3 in Spring 2012. Here's Rick Riordan's website, which is surprisingly content-rich in terms of Greek mythology, teachers' guides for his children's books, online research websites where kids can learn more about Greek mythology, links to relevant online games and lots more information for kids who don't want the Percy Jackson series to end. They can look at maps supposedly drawn by Percy Jackson and Grover and get tons more behind-the-scenes information. A few kids have asked me how to pronounce Rick Riordan's name. It's like Ryer-din, where Ryer rhymes with fire. There's even a link on Riordan's website where he pronounces his own name for you and then reads a bit of one of his books. Thanks for leaving a comment! I'm really glad that you like this blog. And I appreciate you taking the time to read it and comment. Please comment any time!